With joy we announce a new version of Testlab – Eiserner Mann. This version brings some new feature enhancements and in addition, a more scalable way of loading data to the UI which helps you when you have projects with thousands of stories or test cases. All features are immediately live for our hosted customers. Please read more about the new features and changes below. Testlab has always had the coverage analysis view from where you can see how your stories and requirements are covered in testing. 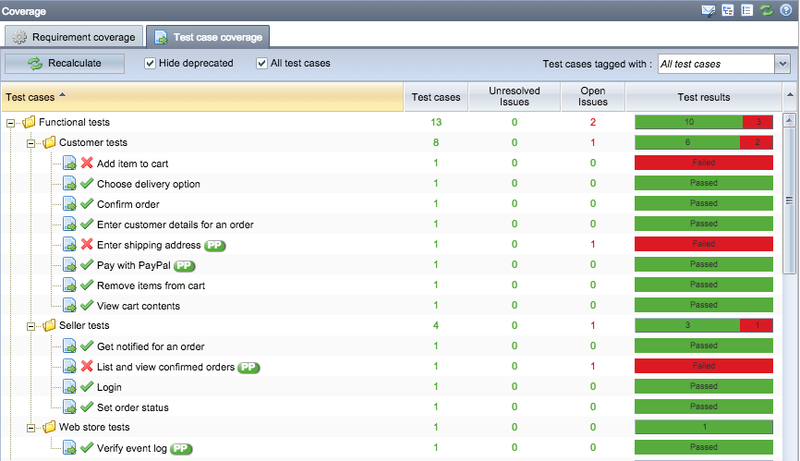 For projects, which for some reason do not hold any stories or requirements, a new test case coverage view has been added which works in similar way compared to requirement coverage but reports the status of your testing against your test cases. 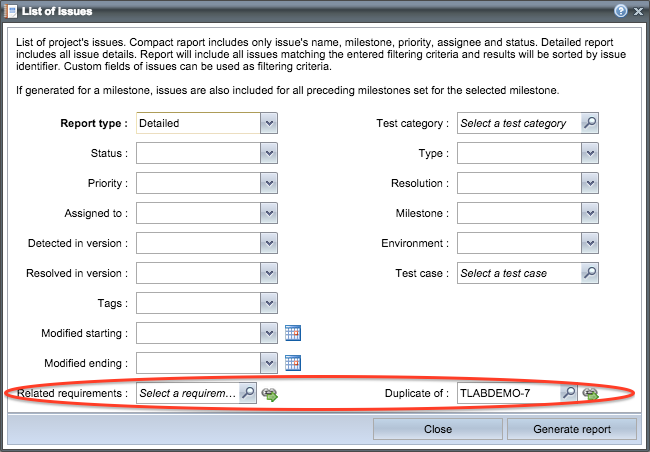 You have the same familiar controls for picking a milestone, a version or a test run to report the status of your testing against or, choose nothing to get all the latest results of your test cases against the whole test plan. The new view is perfect for projects with only test cases and can also be used in combination with the requirement coverage view for all projects. We encourage you to use stories and requirements to make your test plan more manageable, but even if you won’t the new view offers you an easier way to get a grasp on the status of your testing. The reporting engine of Testlab has been enhanced with a possibility to filter the data on your reports with your configured custom fields. If your requirements, test cases and / or issues have custom fields, you can now use these fields to pick the data you wish to include on your reports. All fields are automatically included to the window you configure your report with. 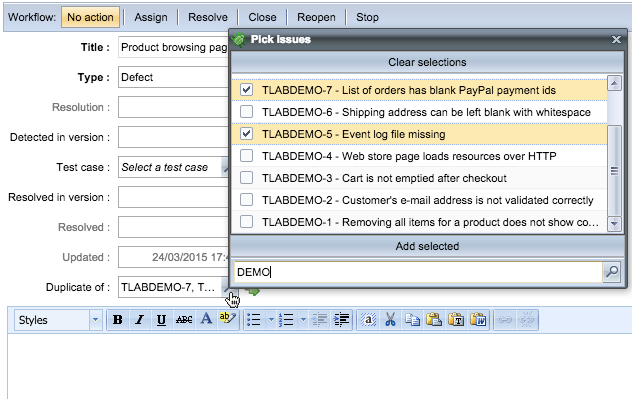 Issues: Allows you to select one or more issues to be linked to the asset. This way you can for example link issues to other issues or, in some other way you prefer. Requirements: Allows you to select one or more requirements to be linked to the asset. A new report has been included which reports the coverage of testing against requirements by listing requirements and related test cases verifying them. This report can be used to inspect the coverage of testing and get a good picture of the status of your testing. 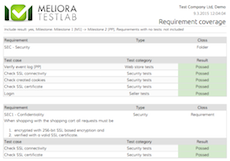 The report basically includes the same point of view to your testing as does the Test coverage view of Testlab. Using the new added link button makes it easy to generate a link which can be used to open up the asset in Testlab. This feature can be found in applicable views’ top right corner as a button with a link symbol. With projects with thousands and thousands of assets such as requirements and test cases, the earlier way of fetching and caching the data of the project in the UI was sometimes a hinderance. This new version has a new strategy of loading the data on demand which makes your really large projects more swift UI-wise. If you wish to permanently delete a whole project from your Testlab it is now possible from the UI. Keep in mind, that deleting projects deletes all the data in them permanently – so use good care when using this functionality. Notifications on your dashboard are now folded in groups to make the notification panel more usable when there are lot of tasks assigned to you. When creating requirements, the context menu in the tree of requirements now offers direct links to create different classes of requirements (stories, folders, etc). Test cases can now be removed from test runs directly from the Test execution view. Earlier, this was only possible while running the actual test run. Der Eiserne Mann (The Iron Man) is an old iron pillar partially buried in the ground in the German national forest of Naturpark Kottenforst-Ville, about two kilometers north-east of the village Dünstekoven. It is a roughly rectangular metal bar with about 1.47 m above ground and approximately 2.7 m below ground. The pillar is currently located at a meeting of trails which were built in the early 18th century through the formerly pathless forest area, but it is believed to have stood in another nearby location before that time.